We believe your home or business is a vital investment and a necessity in this journey through life. We combine centuries old technology with modern roll-forming in order to provide our clients with an attractive, affordable, wind and hail resistant, painted steel suit of armor for the top of your home or business. 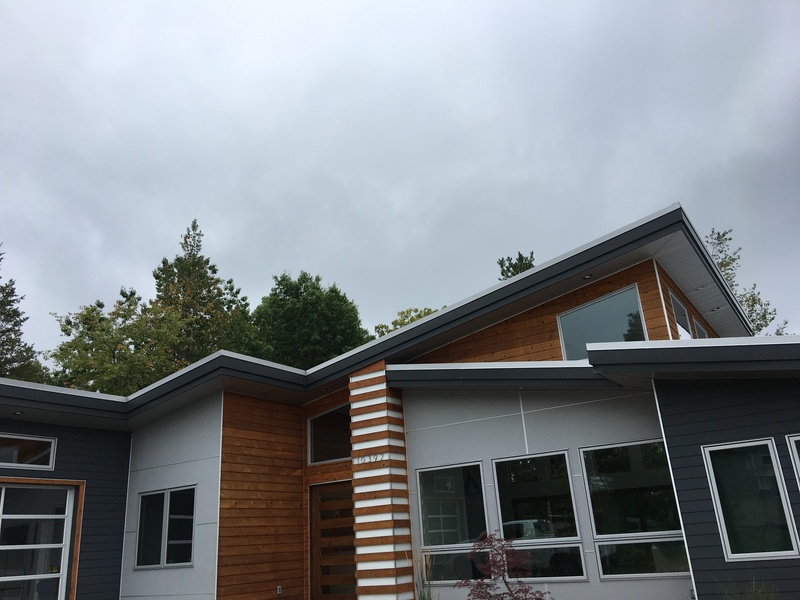 We also appreciate a good challenge and enjoy mixing sheet metals into other exterior applications for your home or business to truly set you apart from the rest. In the 1980's Richard "Mike" Riegle worked in the trades performing various tasks from insulating to siding, soffit and fascia. In 1989, he became tired of working for other contractors and decided to become a licensed builder. Throughout the 1990's Mike built several residential homes, a handful of stores and a few commercial buildings. All the while owning and operating a seamless gutter business. In 1999, worn out from the gutters and looking for a new challenge, Mike decided to sell the gutter business and dive head-first into Architectural Metal Roofing. In 2003, Mike was tired of paying another company to provide the Standing Seam Steel roofing system for him. So with some help from an outside investor, Mike secured a loan for a tow-able roll-forming machine that allows him to produce the Standing Seam panel from coil stock, on-site. eliminating damaged product, short orders and other unnecessary cost over-runs. This allowed him to achieve his goal of offering an affordable, long-lasting roof system to customers all over the wonderful State of Michigan! Small business. Real people. Big plans. Bright futures. Spending his entire adult life in the building trades, Mike gained a wealth of knowledge pertaining to more than just roofing and siding. He's a licensed builder in the state of Michigan and fears no project. Outstanding teacher, mentor, father and leader. Milo served for 8 years in the United States Marine Corps. After serving, Milo moved home to finally plant his roots back into the Michigan soil from which he came. He's currently raising three potential third generation family business owners. The youngest of the Riegle family, Rily just recently joined the team and is quickly gaining the necessary skills needed to thrive in this industry. Rily is living proof that Women can work in the building trades as equals. Aaron has been with Riegle Exteriors for several years, developing and honing his skills. He is currently striving for excellence in all that he does, including his personal life. Thomas, known as Tommy, began his adventure with Riegle Exteriors in the spring of 2017. To date, he is the fastest learning and most eager employee Riegle Exteriors has ever had. When put to the task, Tommy always performs. Devin started with Riegle Exteriors in the spring of 2018. He's currently a summer-time employee as he is also enrolled in college, majoring in the medical field. Reach out to us for a free estimate or more information!